If anyone from DMA is reading this over breakfast, there's probably coffee on the screen by now. But yes, I did co-found DMA, at least according to Wikipedia. I've known about this for a while now and assumed that the fabled self-correcting mechanisms would kick in any moment. After all, anything I've personally contributed seems to have been edited to a crisp within what feels like milliseconds. This is the DMA Design who brought us the classic Lemmings and who were unable to prevent the escape into the wild of Grand Theft Auto. This co-founder isn't merely someone who shares my name either, it's definitely me. And whilst it's true that I was part of DMA from the beginning, I would describe myself more as a hanger-on who eventually got employed than an actual prime-moving founder. It also means that I've now got my own opinion on the accuracy issue which hangs around the world's best known wiki like the summer smell from a landfill. Wikipedia's article on DMA, since morphed into Rockstar North (though not seemingly in spirit) has a reference to MobyGames where my co-foundery was seemingly initiated. They are themselves busy crowdsourcing a catalogue of everyone who's ever worked in the computer games industry, apparently based on the credits in the games themselves. For a while I was even split into two people under Steve and Steven. In my entry there's a small but incomplete list of games with which I had some hand in, but also mysteriously a title which I had nothing to do with, dated 2000 or three years after I left the industry. So far just a mistake, I presume, and normally that's not a big deal. The tax office once mistakenly thought I had two jobs simultaneously and nonsense like that, if they'd known about it, couldn't have helped my case. So my developer entry in MobyGames has got it mostly wrong, even though they make no mention of co-founding anything, let alone the one time largest independent developer in Europe. 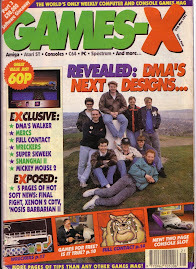 However, the mini-trail at MobyGames ends with the Rockstar North history, not DMA Design, as contributed by a one B.L Stryker and Sciere, of whom I know absolutely nothing although one of them thinks he knew me well enough to call me a co-founder. How he came to believe that about me I cannot say. I could update Wikipedia directly, if I felt like it, but I have a possibly old-fashioned bar against writing anything about myself. After all, how do I know I've arrived unless someone else validates it by creating an entry for me? (Dave Jones is possibly the most famous man I know and he warrants a paragraph.) In any case, what could I point to as the source of this fact if someone labels it with the famous ? Hey man, I was there, wouldn't appear to cut it since there's nothing for me to point to and say “see?” That is, unless I have my own web page, in which writing it elsewhere provides a valid reference and I'm free to write whatever I like about it. Maybe even this blog entry. If I have a consultation with myself about it and then edit Wikipedia, does that fall foul of their tut-tutting against original research? Or could I in fact update the MobyGames entry instead and eventually someone would incorporate that knowledge into Wikipedia. Knowledge which gets copied elsewhere and then cited as true, with the original source as unknown as the source of the Amazon in Victorian times. In either case whatever I happen to say about myself is likely to end up in Wikipedia unchallenged because after a few removes it apparently sheds off the layers of personal bias and becomes definitive. Such as, perhaps, the little-known one that I really am a co-founder of DMA Design*.